I’ve decided to start with writing small to the point blog posts on Supreme Commander Forged Alliance whenever I stumble upon a good topic. For those who don’t know it, this is the best Real Time Strategy game out there. It’s been said that it is to Star Craft what chess is to Tic-tac-toe. Check out the community maintained multilayer service Forged Alliance Forever for more info. Lately I’ve been playing a lot of Phantom-X games on the Four Corners map. This changes up the Phantom meta compared to the usual maps so much and leads to games I find way more interesting. One scenario I’ve run into a few times is that I’m UEF inno and am next to a UEF phantom that spams a crapton of Percivals. I started wondering how effective T1 PDs are at countering percies on this map, and did some testing to find out. In most situations percies will straight out win, since they can pick off the T1 PDs from a distance, as their range is significantly bigger. However on this map, the percies have to move through the water first, a period during which neither they not the t1 PDs can exchange fire. And once they emerge from the water, they’ll be in range of the PDs (unless you placed them real bad). Even with this advantage, how mass effective is countering percies with T1 PDs? Percies have a 4 second firing cycle and deal 1600 damage per shot, thus one-shotting T1 PDs. During my testing I found that you can build 5 PDs for the cost of a percie. I did not look into the stats further, as the best way to find out how they actually compare is to let the game itself do the work. The simplest scenario is 1 percie vs 5 PDs, which is what I started with. The percie wins, with 20%ish of its health left. Next I tried 3 percies and 15 PDs. I figured that the more percies, the more the advantage would go to the PDs. Some percies might target the same PD, plus they do not all emerge from the water at the same time when in group. A third factor is that the DPS of the percies goes down in “bigger steps”. (If you do 90% damage to a single percie, it will still have 100% dps, while 90% to 5PDs will only leave 20%.) And indeed, like this the PDs win, with 4 or 5 PDs surviving. Moving up another step to 10 percies and 50 PDs, the difference gets even more pronounced, with half of the PDs surviving. As UEF also has access to the highest health per mass cost unit in the game, the T2 mobile shield, I also experimented with this. The mass cost of such a generator is only half that of a T1 PD, and it takes percie shots to kill the shield, and then another to kill the generator. Interestingly, the generators appear to get targeted before the PDs, which in this situation is advantageous for the defender. 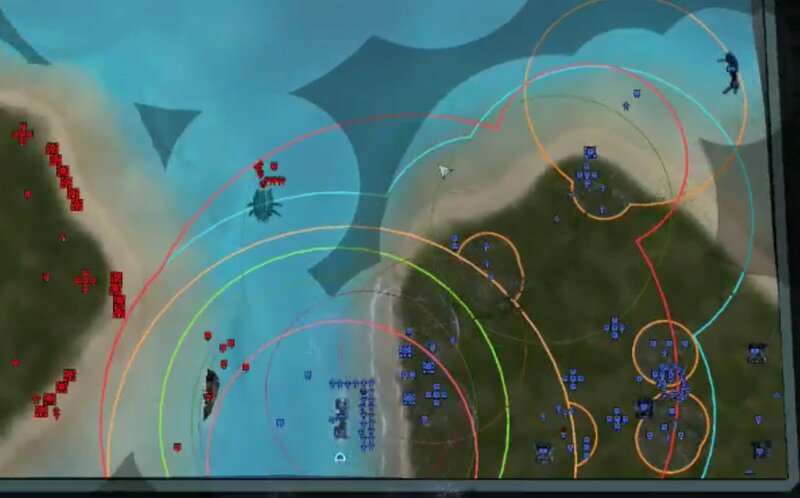 Repeating the 10 percie assault when there are only 45 PDs and 5 shields leads to the shields getting killed and only a few PDs dying.